The great thing about patch pockets is that they don’t depend much on the cut of the main garment. 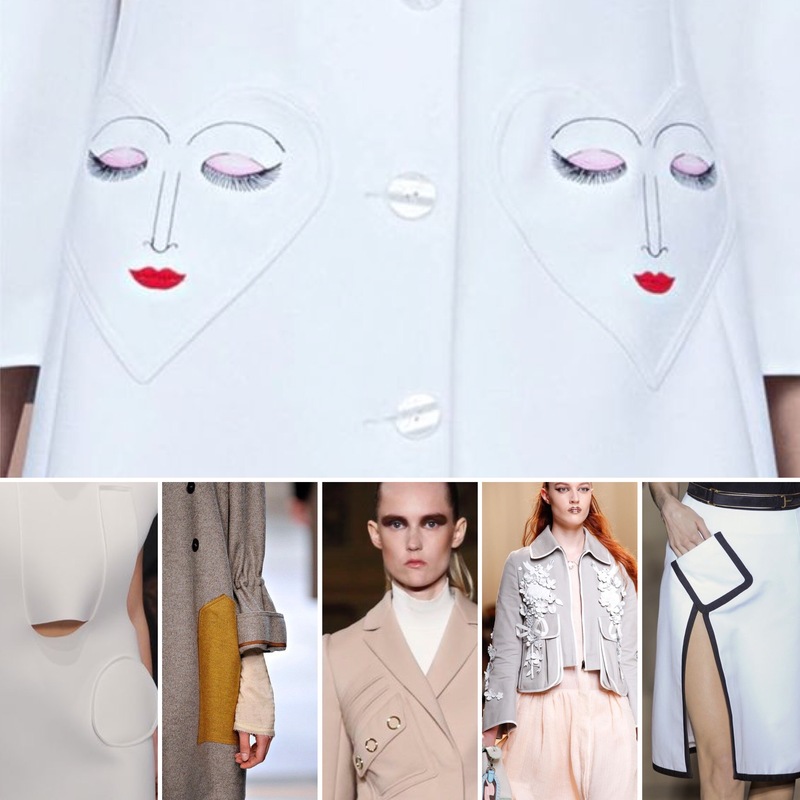 You can add them to just about anything (as you’ll see in some of the unusual runway styles below). 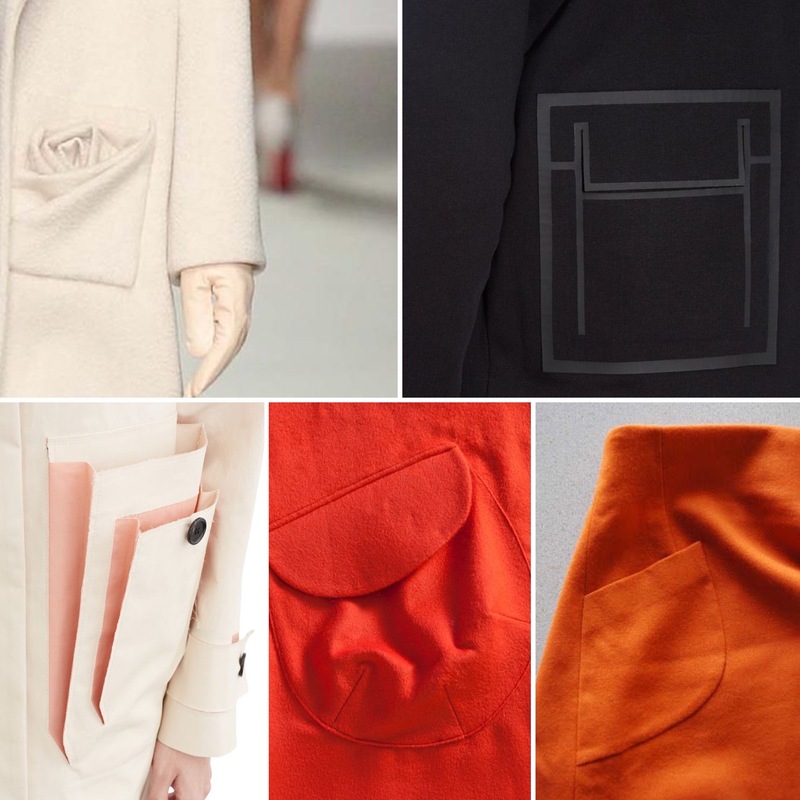 Here are 26 really interesting patch pocket ideas we’ve come across lately, from giant 3 dimensional pockets that practically act as handbags, to futuristic shapes and cutouts. I would have to say , not impressed with any of the designers ideas for patch pockets! Oh well to each his own! Thanks for the interesting tidbit, Sarai. yeah – patch pockets on a blouse are difficult to place at best, but that really didn’t work! 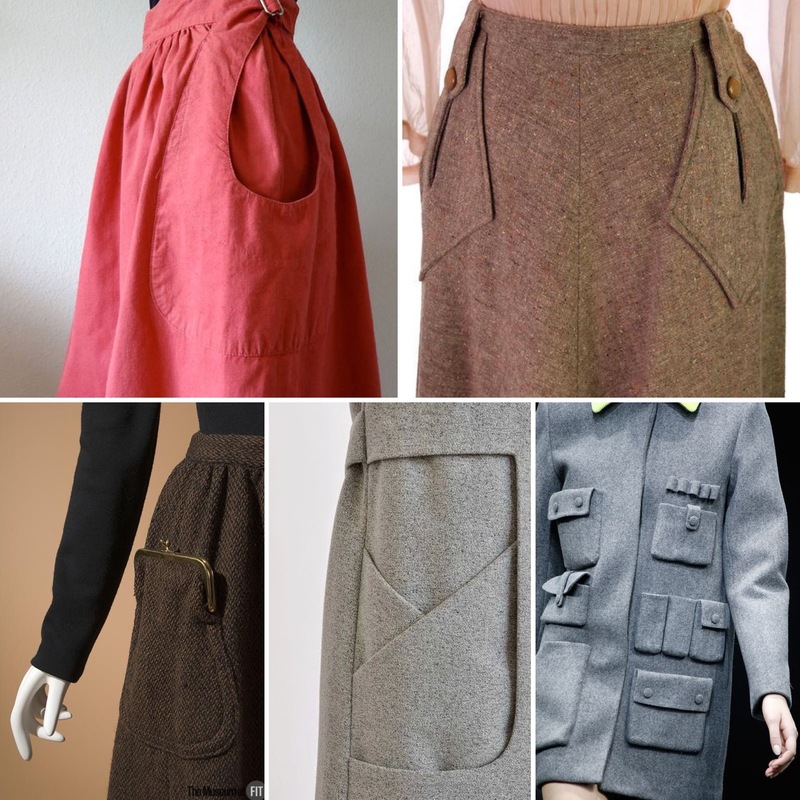 The two that I liked best wree the red linen ’80’s skirt and the ’40s brown tweed – I looked at that one and said, “inspiration 1947” before I ever read the caption! Some very interesting pocket ideas, indeed! The Bonnie Cashin skirt pockets are my favorite, I think. Why waste valuable hand carrying capacity on a clutch when you can have one sewn right in to your garment?? Thanks for this reminder on the possibilities with patch pockets. I’ve often unfairly judged them to be unsophisticated, but clearly not, and now I have some great ideas for using leftover fabric. 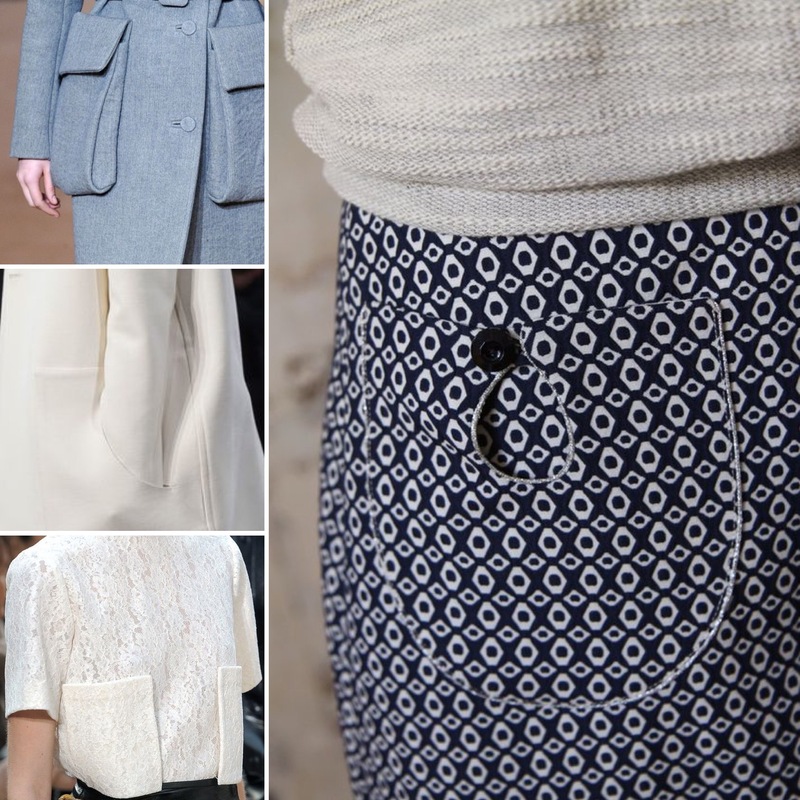 Love those detail inspiration posts – patch pockets, topstitching, etc. Please keep them coming! Thanks for all these tips. I have one of those special feet, tried it once and ended up with a jumble of threads and gathered fabric. Now I think I’ll try again. I love them ,both the graceful and the klunky. Very inspiring. Joy, interesting info about the 1800’s pockets. I have never heard of them. Will be doing some more research. Cheers Judy. The clasp pocket was Bonnie Cashin from the 60’s. Hey, y’all! I need help doing a rounded patch pocket on knit pants for my son. Do I still do a stay stitch and the clip info the rounded area? 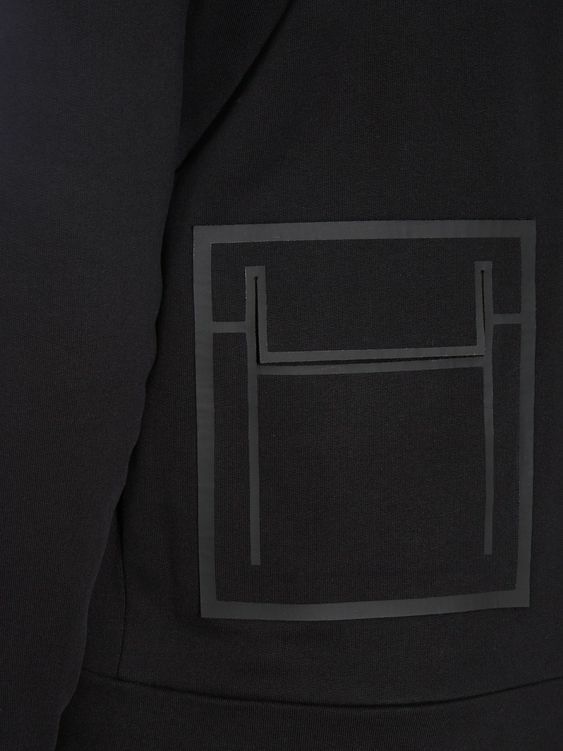 Btw, those hole pockets are so avante garde. Love em! 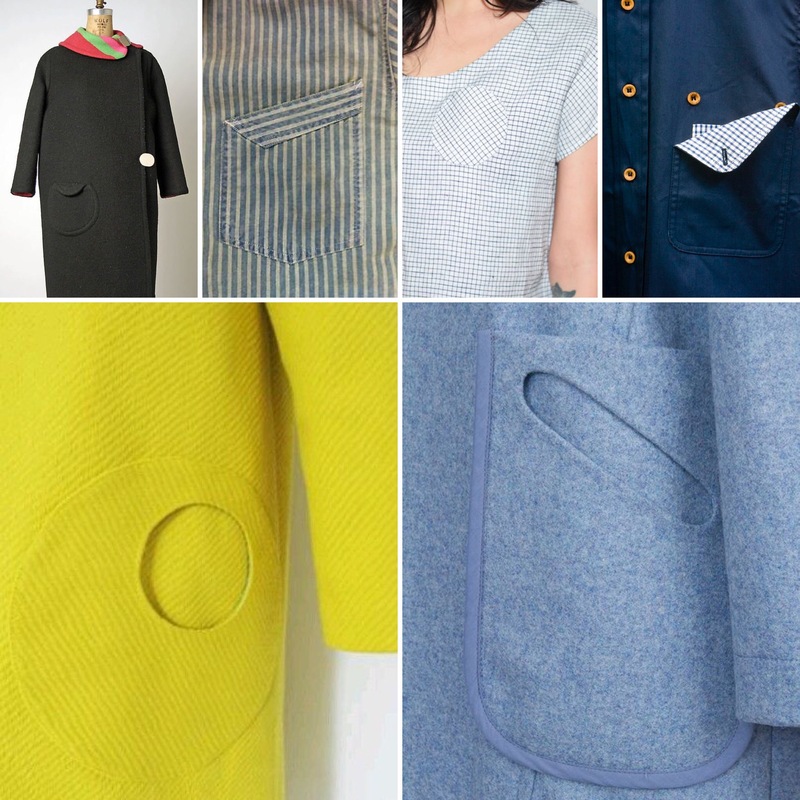 Not like the euro hole pockets, but actual circle hole patch pockets?! Love!! I really love these. I think the red linen one is my favorite. It looks big enough to comfortably hold a kitten while being visually interesting! Great idea would love to try all of them,dont know which one to try first. I just like pockets. Thanks for sharing. Love these inspiration posts. I’ve only added inseam pockets till now. Will try patch pockets like the red one. I love these ideas! I was introduced to the patch pocket when I first learned to sew many years ago and, quite simply, fell in love with them. I am delighted to see the creative variations posted here. Thank you! Thank you for sharing, that gives me another look to these beautiful details again. I think now, I will deal again with the construction of beautiful bags. This was a very lovely and idea filled article. Can’t wait for more. Great article. Love how you focus on one design aspect and give lots of options. This was so good to see all the photos of the different kinds of pockets. It really made me think about what I can do make an outfit just a little different without a lot of work fitting a new pattern. Sometimes, we just take a pattern at face value and don’t look at all the possibilities to make it the most versatile pattern we own! I can’t tell you how many patterns I have purchased over the years that are really the same pattern, but with one design change! Thank you for all you do!